East Ascension are looking to finish the season strong after winning two of their last three games. QB Kyran Irvin and DB Johnny Baker are major parts of this team who do a great job leading on and off the field. Irvin is one of the best athletes in the state. Baker is going under the radar, but will make a nice surprise for any program who takes him. Meet both of these guys in today's Recruit Video! LAFM 10th Season! Episode 7! October 20, 2015	Comments Off on LAFM 10th Season! Episode 7! We have a great show lined up for you this week. Lee goes over the 5A-1A High School Players of the Week. 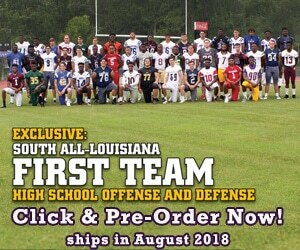 Madison Prep Head Coach Michael Roach and Crowley Head Coach Josh Fontenot stop by to talk about their respective teams and outstanding seasons. We will have a surprise call-in from one of the top recruits in the state. Lastly, Lee and Reid go over their college and high school picks. Should be a great show, make sure to tune in to LAFM TV! Archbishop Shaw Football has a long history of success. The Program has produced some great players over the years such as Mickey Guidry, Ryan Clark, and Joe Albergamo. This year's team has already started making headlines with a big win over St. Augustine last week. Meet QB Matthew Keller, RB Trey Ragas, and DB Sean Dumas in today's Recruit Video! Week 6 games were played October 8th -10th. We announce are winners live on our show every Tuesday night. Depending on the area, our show may not hit your town/city till later in the week. At the bottom of this post, you can see the listings for when and where the show comes on every week. When you talk about the rising football programs in the state, you have got to mention Parkway High School. These guys have been on a roll the last few years winning a lot of games and producing some top recruits. We got to meet some of the Panthers this past summer. Meet QB Keondre Wudtee, OL Ledarean Patterson, LB Lloyd Cole, and RB Robert McKnight in today's Recruit Video! We have a great show lined up for you this week. Lee goes over the 5A-1A High School Players of the Week. We have an Interview with QB Cole Kelley (Arkansas Commit). Plaquemines Head Coach Paul Distefano and Scottlandville Head Coach Robert Valdez stop by to talk abou their respective teams and season. We will have a call-in from Loyola Prep OC Steven Geter to talk about his team and their exciting QB, Bishop George. Lastly, Lee and Reid go over their college and high school picks. Should be a great show, make sure to tune in to LAFM TV! In today's Recruit Video, we have Mansfield's Stanley Woodley and Head Coach Glen Hall. FB/LB Stanley is an underrated recruit who could be a really special player in college next year. This kid is not afraid of contact. He will plow over you at FB and go head to head with anyone at LB. Coach Glen Hall is one of the better coaches around the state. He is great when it comes to developing talent and working with his players. Meet both of these guys in today's Recruit Video! You do not often see two brothers playing on different high school teams. Well, Kyle and Kody Shexnayder are not only brothers, but twins as well. Kyle is the QB for Holy Cross. Kody is a Punter for John Curtis. They are both great kids who are competitive and enjoy playing against each other. Meet them in today's Recruit Video! We have a great show lined up for you this week. Lee goes over the 5A-1A High School Players of the Week. We have an Interview with Airline OL Colton Prater (Texas A&M Commit). St. Augustine Head Coach Al Jones stops by to talk about his team (beaten Jesuit and Brother Martin last two games). Southern WR Coach Chris Coleman comes on to talk about their outstanding All-SWAC WR Willie Quinn and the Southern Offense. Lastly, Lee and Reid go over their college and high school picks. Should be a great show, make sure to tune in to LAFM TV! Week 4 games were played September 24th-26th. We announce are winners live on our show every Tuesday night. Depending on the area, our show may not hit your town/city till later in the week At the bottom of this post, you can see the listings for when and where the show comes on every week.